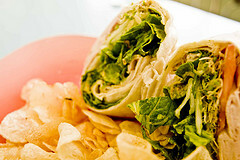 Here's a delicious Asian Chicken Wrap that's perfect for warmer weather. It's loaded with veggies so it's also healthy. I like that – 424 calories and only 20% from fat. And only 30 minutes of Prep Time – perfect! You can serve them with Sweet potato fries or chips on the side and a fruit or green smoothie. 1.In a large bowl combine Chinese cabbage, lettuce, bean sprouts, bell peppers, salad dressing, and soy sauce. Toss together, mixing well. 2.Place veggie mixture across center of each tortilla to withing 1 inch from outer edge. 3. Thinly slice chicken breasts and arrange slices on top of veggie mixture. 4. Fold 1 side of tortilla over filling and roll tightly. It's a wrap! (I've always wanted to say that.) And this one's a great addition to your recipe file. Great for lunch, dinner, or anywhere in between! So try it out and let us know what you think. Good – bad, or so so...rate the recipe! Want more Wrap Sandwiches? Try a Barbecue Beef Wrap!